Clustertruck is a first-person 3D platformer, and the latest game developed by Landfall Games, and published by tinybuild. 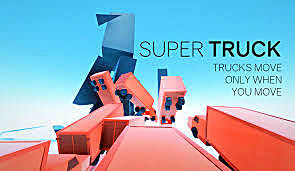 It is a fast-paced and challenging platformer, with controls and high-speed pacing akin to a 3D Super Meat Boy, where you jump between moving trucks whose fated actions are wholly unpredictable, all without touching the floor or walls even once. And people say there are no new ideas. 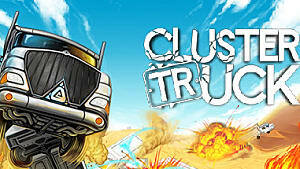 Clustertruck is a prime example of easy to learn but hard to master. The base mechanics are jumping, running, and not running when necessary. There are also a variety of purchasable abilities that will make the game easier, as well as deepen and drastically change up the gameplay, all available for purchase between levels using the points you earn for performing tricks and beating levels. 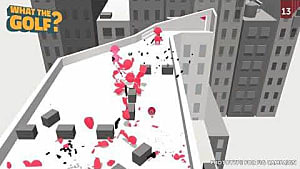 These range from basic yet helpful additions such as a double jump and a brief slow-motion power, to ridiculous overhauls of the gameplay, including one that changes the gameplay to imitate the recently released Superhot, making it so time only moves when you do. But regardless of what abilities you may use, no matter how you play Clustertruck, you will need to fully learn it's basics in order to master the art of flying through the air and hopscotching across the sea of speeding trucks. Clustertruck is a game that is purely about gameplay. There is no story of any kind, or any context as to why you are jumping between the seemingly never-ending supply of trucks, let alone how they got where they are. 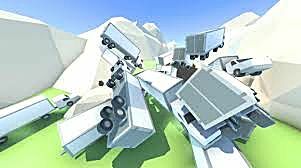 You're just given a basic tutorial at the start, then you're let loose into the fast-paced and nonsensical world of truck-jumping laid out for you, and expected to adapt under pressure as the game gradually becomes more difficult over time. There are 9 worlds in the main campaign, all in vastly different locations with different obstacles, with 10 levels per world, totaling at 90 levels. The difficulty is real in Clustertruck, with precise jumps and split-second timing constantly being asked of the player, but as with any game, your mileage may vary. I for one found the game consistently challenging with a solid sense of progression, only getting truly frustrating in the last two worlds, and ended up beating the main campaign in about 5 hours. However short the game may be, it's packed with variety, and rarely ever repeats itself with level structure, theme, or any obstacles. Some worlds will have giant hammers knocking the trucks off of cliffs, while some have missiles or lasers coming from various places, and some even have tractor beams that push and pull the player. 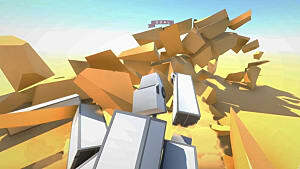 Sandy dunes, slopes, and icy surfaces will affect the trucks movement as well, so even the changing terrain will change up the platforming, even if the player can never touch it. A common, yet still exciting, occurrence in Clustertruck. In addition to this, it's rather difficult to play the same level the same way more than once, due to the variables of the game's physics. 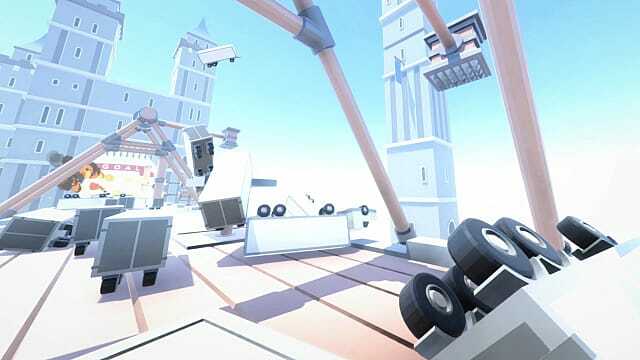 Both the trucks and the player character operate on a physics system, which causes terrain to affect the trucks' movement, as well as making memorizing patterns next to impossible due to numerous variables. This forces the player to act quickly under pressure and get creative with their solutions. It also allows for the player to manipulate the trucks a small amount, depending on where they land on them, or where they stand on them. This keeps the game consistently fresh and surprising, alongside the new, and frequently added, obstacles in each level. Aesthetically speaking, the game is quite pleasant looking. The graphics aren't pushing boundaries by any means, but it all looks very distinct and smooth with solid colors and clean shadows, and just the right amount of motion blur during the fastest and most intense sections. The music is fitting as well, but while I would call it good music, I didn't find it very memorable. I simply wouldn't be able place most tracks with the worlds they belonged to. So, what's here in terms of additional content? Clustertruck's content aside from the main campaign seems to have the intent of creating a well-supported community. 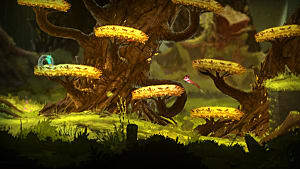 The game features a level editor that allows players to create and share their own levels, as well as an online leaderboard for the best time on each level, and built in Twitch-integration for online streaming purposes. There is also a ghost racing mode, where the player can attempt to beat a developer ghost player to the end of a level. As well as achievements to unlock, including one for beating the game using no abilities for those seeking a true challenge. What kind of game is this really, and who will enjoy it? What you see is what you get with Clustertruck. If you go in expecting a slew of challenging and creative levels about jumping across trucks, that's exactly what you're going to get, but if you aren't the kind of person who cares to replay levels for a better score, you should look elsewhere. While Clustertruck is certainly a very fun and exhilarating game on the first play through, it is also clearly a game with replay-value and in mind; where any additional content will come from the player's own experimentation, or the community's user-made content. Aside from this, there's little to complain about in Clustertruck, as what it brings to the table is done rather well. Just understand that it can be truly difficult at times, with the final level taking me over 30 minutes and many deaths to complete. At just $15, Clustertruck has just the right amount of content and creativity to join the ranks of other inexpensive indie hits, and the unique premise and teeth-clenchingly tense gameplay alone make it worth the purchase. If you're a fan of 3D platformers, and want to see a rare example of a first-person platformer done well, or just a really good platformer in general, then you owe it to yourself to play Clustertruck. It's fast, intense, and off it's trucking rocker. Review copy provided by developer, Landfall Games. Clustertruck is a chaotic, fast, and fun first person 3D platformer that further proves that video games are far from out of ideas. Join the chaos of Clustertruck next week!